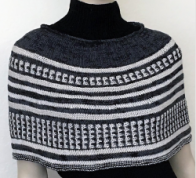 First of all, I wanted to thank all of you for leaving your comments on Mosaic and Lace Knits review. It was wonderful to read all of them. As promised, one of you will get a free copy sent by the publisher. So, here we go. 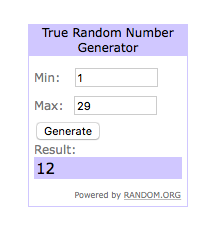 We had 31 comments, but 2 of them were mine 🙂 I am putting 29 comments (as they came) in the random calculator to get the number that is assigned to one of you. Comment # 12 belongs to….Brenda Helman!!! Congratulations, Brenda! I am emailing you right now, so you can give me the shipping address. Come back for more reviews and giveaways.